Conference, seminar, coaching and meeting rooms in any size and for any need for important conferences, workshops, team meetings and conversations with customers are various representative meeting rooms, coachingrooms, lounges and a large roof terrace available. 2 to 20 people have ample space in the various quiet and bright rooms. Equipped with Wi-Fi, projector, screen, whiteboard, moderator case, flipchart, pin we offer conference rooms for concentrated and pleasant work. Conference room with roof terrace "Alsterblick"
Lilienhof "Alsterblick" conference room for up to 20 people plus direct roof terrace of this bright, friendly and of course fully equipped conference room offers space for up to 20 people. The room is located on the seventh floor of our storage House with direct access to our roof terrace with view of the Alster Lake. 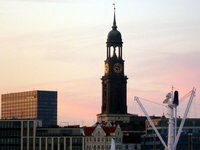 From the terrace, you have great views of the Tower, Planetarium, and the Inner Alster Lake. The room "Alsterblick" plus roof terrace is available during the week and on weekends. He is available around the clock and can be reserved with or without beverages or catering. 2 persons meeting- / coaching room "Elbe"
Lilienhof small meeting room "Elbe" this little light, very quiet and friendly coaching and meeting room offers enough space for two people. It is equipped with comfortable chairs, table and floor lamp, Wi-Fi, PIN, green plant, flipchart and VoIP phone. On request a video projector, presentation case, drinks is catering etc. available. The two person room "Elbe" is available during the week and on weekends. He is available around the clock and can be reserved with or without drinks and catering. "Michel" Lilienhof - Conference room for up to 6 people, this bright and friendly, fully equipped conference room, provides sufficient space for up to 6 people. The room "Michel" is in the week and on weekends available and can be reserved with or without beverages or catering. A flipchart, PIN and Internet are included in the price. 6-person conference room "Rickmer Rickmers"
Lilienhof "Rickmer Rickmers" conference room for up to 6 people you are looking for a tasteful Conference or meeting room, conveniently and directly in downtown Hamburg, between the Alster and station? Welcome to us in the Lilienhof. We have several conference and meeting rooms from 2 to 20 people. The quiet, bright and separate window room is suitable for meetings of all kinds up to 6 persons. The room "Rickmer Rickmers" is a week - even at the weekend - available and can be reserved with or without beverages or catering. A flipchart, PIN and Internet are included in the price. 12-person conference room "St. Pauli"
Perfect rooms for your meeting, Conference or meeting - "St. Pauli" Lilienhof - Conference room for up to 12 people looking for a suitable conference room for your event or meeting? Welcome in the Lilienhof. We have several Conference and meeting rooms from 2 to 20 people. This bright and friendly, fully equipped conference room offers space for up to 12 people. The room "St. Pauli" available during the week and on weekends available and can be reserved with or without beverages or catering. A flipchart, PIN and Internet are included in the price.